If you're a smartphone babier or gadget lover without weekend plans, you might consider making a trip to Nova Scotia. This weekend, a church in the Halifax area is inviting people to bring their gadgets in for a special blessing. The service -- called "Grace for Gadgets" -- was thought up by the Rev. 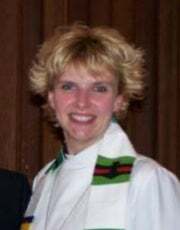 Lisa Vaughn, pastor of the Anglican Parish of St. Timothy in Hatchet Lake, south of Halifax, Nova Scotia, Canada. She hopes it can help the church combat dwindling numbers in its parish by attracting a few nonbelievers and faithful techies. Vaughn doesn't claim she'll be able to fix any problems will annoying apps, proximity sensors or overheating laptops. She's blessing the person behind the technology. She told The Globe and Mail, "It's not just about 'please don't let my cellphone drop calls today.' It's about, you know, help me to be the best Christian, the best person I can be in my conversations, in my communication." "The old-fashioned tradition of blessing working implements like plows, farm animals and other tools is less relevant to us today who live in the city. However, on Labour Day weekend ... we're going to have a blessing of high-tech electronic tools - things like cell phones, BlackBerries, netbooks, iPads, eReaders and laptops." Vaughn seems to be a bit of a technology person herself. She told The Chronicle Herald that she has three laptops and three desktops in her house and plans to buy a smartphone soon, but isn't sure which kind yet. She uses Facebook, has a blog and plans to create a Twitter account for St. Timothy's. Christians need to embrace the Internet, although it presents challenges, she said. "That's where a lot of our folks are -- they're e-mailing, they're texting. And if that's where they are, that's where we should be," Vaughn told The Chronicle Herald. The Vatican agrees. Earlier this year the pope asked priests worldwide to use social media as a way to spread the word of God. Gadget blessings will occur during three worship services on Sunday. I'm not sure the promise of a blessed gadget will attract many atheists. It could bring in a few people who aren't regular church-goers or those who make only the biannual visits for Easter and Christmas. But the pastor is correct that the idea of blessing the tools of one's trade does have a history in spiritual care. Check out the full story and a video of an iPhone blessing at The Globe and Mail.